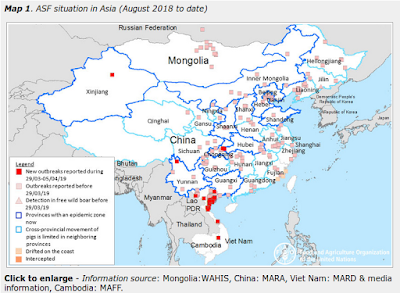 In recent weeks we’ve looked at some of Hong Kong’s preparations for the possible introduction of the H7N9 virus into their region (see Hong Kong: SFH Outlines Measures Against H7N9 & Hong Kong: Avian Influenza Drill). Today we’ve some remarks from Hong Kong’s SFH (Secretary of Food & Health), Dr. Ko Wing-man, on the two ways in which H7N9 might make its way into Hong Kong, and the steps they are taking to prevent it. Secretary for Food and Health: There will be two possible channels that avian influenza A(H7N9) would be brought into Hong Kong. The first channel is through an infected human case and the second is through chickens. For a human infected case, the assessment has all along been that a person might possibly be infected on the Mainland and without the relevant symptoms when he or she travelled to Hong Kong. This possibility is always present. That is why we have to strengthen all the risk and infection control measures, including body temperature surveillance at the border. The more important end is at the frontline of our medical facilities. Early identification of such cases will lead to early isolation of patients and this will help us bring down the possibility of the spread of avian influenza A(H7N9) infection among the population of Hong Kong. Another report, via this slightly syntax-challenged machine translation, gives us a look at some of the anti-H7N9 steps being taken by Hong Kong Authorities. Secretary for Food and Health Ko Wing-man said that influenza will start at 20 degrees or less active, Mainland twelve weeks prior to the emergence H7N9 cases. Hong Kong's existing supply of live poultry for the H7N9 risk management measures has reached a very high level, some experts believe that is enough, some experts have proposed to do more to follow up with the Mainland authorities. Ko Wing Man today (November 6) Inspection "2013-14 Annual Government Vaccination Programme" implementation after meeting with the media, said that since last year, East outbreak H7N9 avian flu, the Hong Kong health care system and food safety authorities have taken a series of measures, there has been no let up, and today there are meeting risk assessment. He said that the current H7N9 virus genes have not found major changes, so to maintain the level of risk assessment. The Government will strengthen the temperature probe in the port of entry, and strengthen education, improve cross-boundary students and other health conscious. Hospitals, in addition to the prevention of various diseases with high morbidity winter and seasonal flu, we will also strengthen against H7N9 in "Early diagnosis and isolation", and other infection control measures. Speaking recently, Dongguan City, a year-old boy diagnosed with avian influenza A H7N9 infection, he said that the mainland still had for the boy to be inspected poultry markets, has introduced a series of poultry wholesale and retail markets for the control of measures, including cleaning, suspension and "clear day" and other similar policies in Hong Kong. He attended the annual event tomorrow to Shenzhen inspection and quarantine seminar will follow up with the Mainland authorities prevention and control measures. Ko Wing Man said Hong Kong has two annual seasonal influenza season, mainly between winter to spring. Government has embarked on influenza vaccination and subsidy schemes were hospitalized chronic high-risk groups of people vaccinated, children and the elderly and funding to private clinics vaccinated. He said that the flu itself is not a serious illness, but there are few people, especially low resistance and chronic diseases, seasonal flu might arise from the more dangerous complications. If large-scale outbreak of influenza in Hong Kong, while avian invasion, there may make two kinds of influenza virus in the same recombinant human body, when flu may be more severe or high pathogenicity, so I hope the public will receive the seasonal flu vaccine. His last point – urging seasonal flu vaccination because of the possibility of a seeing a reassortment between the H7N9 virus, and an already humanized influenza A strain (H1N1, H3N2) - is something we’ve discussed before. While rare, a reassortant or hybrid flu can emerge when a host (human, swine, avian, etc.) is simultaneously infected with two different flu strains. In 2011 we saw an influenza co-infection in Canada that led to the creation of a unique hybrid reassorted virus (see Webinar: pH1N1 – H3N2 A Novel Influenza Reassortment). While in 2010, in EID Journal: Co-Infection By Influenza Strains, I wrote about a study in New Zealand during the opening months of the 2009 pandemic that discovered at least 11 co-infections (out of 1,044 samples tested) with the older seasonal H1N1 virus and the newly emergent pandemic H1N1 virus. Admittedly, most reassortments do not result in a biologically `fit’ and competitive virus. Most are evolutionary failures, or brief flashes in the pan, only to be drowned out by more robust strains. Were it otherwise, we’d be hip-deep in emerging viruses all the time. But in the rare event that one does emerge, it can have the potential of sparking an epidemic or even a pandemic. The good news here is that Hong Kong provides some of the best influenza surveillance in the world, and should H7N9 begin to spread readily, or a new hybrid (reassortant) virus emerge in that part of the world, they will likely know very quickly and will alert the world.